You can’t see me. I bet you’ve had this happen to you. You buy a car, van, or truck, and then everywhere you look, you see dozens of the exact make and model vehicle that you just bought on the road. In the same color even! The mind can play tricks on you. Just because you didn’t notice them before doesn’t mean they weren’t there all along. 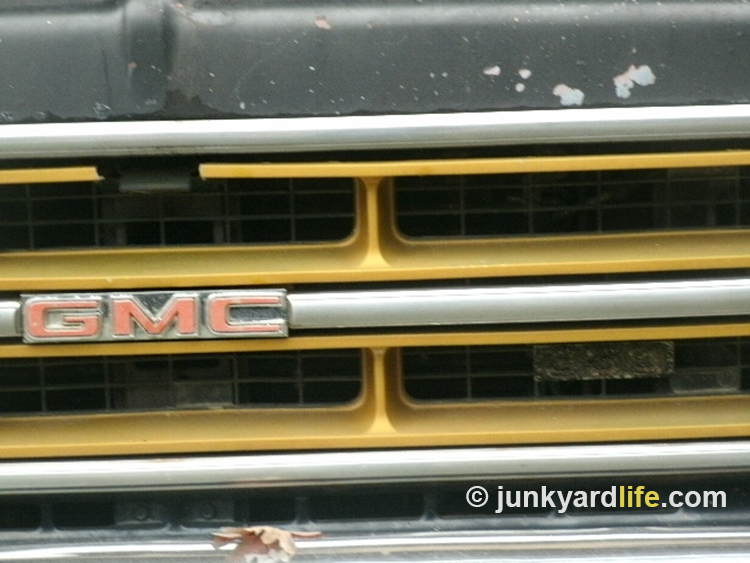 We thought spotting a 1975 GMC Gentleman Jim in the wild was an impossibility, that is, until Ron Kidd wrote about them a few weeks ago. 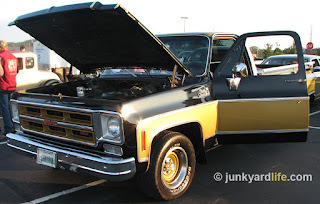 No sooner had the story about these rare trucks, produced for just half of the 1975 model year with less than 1,000 total units built, hit our pages when we trip over one in our central Alabama stomping grounds. No one would believe us, so we had to show you. 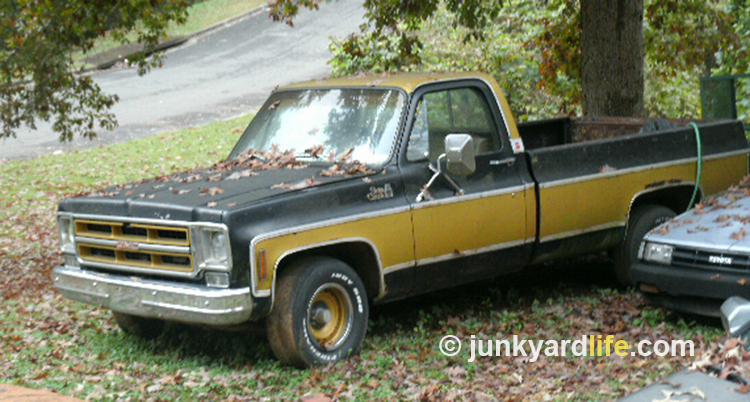 Take a look at what appears to be an original paint Gentleman Jim parked in a yard. Unique gold grill insert is a Gentleman Jim clue. 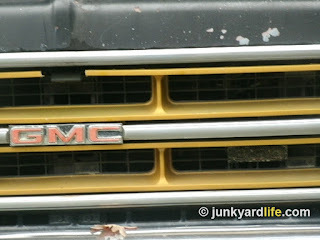 Side view of 1975 GMC shows that the fancy gold "Gentleman Jim" decals are no longer on the bed. This solid looking, and straight 1975 GMC Gentleman Jim was available in long wheelbase only and it appears to be serving as the perfect, classy, do-it-all, part-time work truck. No one was home to answer our questions about the Gentleman Jim in the yard, but we assume that the owner knows they have a rare classic. It looks original and unmodified. The dirt-stained spots on the tires could mean it has recently been moved after sitting for awhile. That’s a good sign. Keeping old things moving is the best bet for survivability. 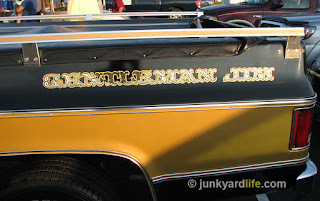 It works for people and trucks named Gentleman Jim. Gentleman Jim gets the girl. 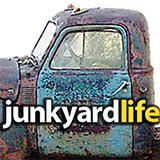 Have you ever noticed that if a vehicle is odd and a little audacious that we here at Junkyard Life probably want it? Trans Ams, funky vans, boats to pull behind Trans Ams and funky vans, side pipes and the love of fads from way back are always cool with us. 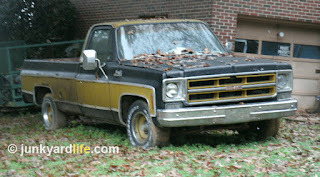 So now, we find a perfect pickup truck that seems to fall right in place with us. When a regular old truck just won’t do... Gentleman Jim is your answer! 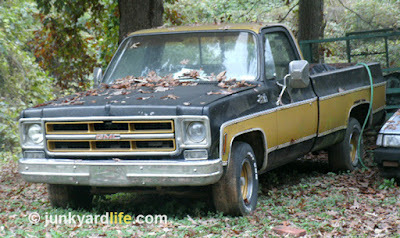 Striking black and gold paint are the first clue that you may have found a 1975 Gentleman Jim GMC Sierra. Give us a yacht club kind of a truck. Affluent with a classic kind of flair. Notice the sparkly metal flake callouts Gentleman Jim had on his quarter panels. This luxury truck was going to be packed with options. Some literature indicates an AM/FM with a tape player was included in the Gentleman Jim package. To insure you could hear the symphony over the roar of your V8, GMC also included a lot of sound deadening they call “acoustic insulation”. This also precluded any other rattle and pop sounds synonymous with pickup trucks. Stirred, not shaken. Gentleman Jims were loaded, including bucket seats, full gauges with tach, and AM/FM/8 Track stereo. Bright gold lettering announces the "Gentleman Jim" package on the flanks of these special edition 1975 GMC trucks. Special editions would not be complete if they were just any old color. Gentleman Jim wore a very fitting gold and black two-tone paint. They also used gold colored-keyed wheels with fat, muscular 60-series tires that gave it an aggressive stance. Perhaps even a fighter stance, Mr. Flynn? Look closely and you can spot the tachometer in the dash. Being above all of that “truck” nonsense of utility oriented vehicles of the time, let us be distinguished. They didn’t want you to see the bed unless necessary. So Gentleman Jim covered his rear (so to speak) with a factory black bed cover. 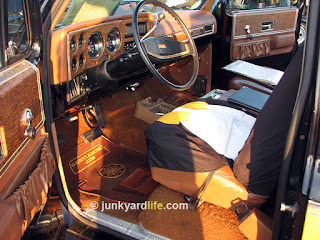 He also used bucket seats and a nifty center console that provided space and if need be, seating for a third person. Cruise control, air conditioning, cloth interior accents, tilt wheel and a full compliment of gauges almost completed the package. Gentleman Jim wasn’t happy with just analog gauges. He needed a tachometer. He got one! We love factory tachometers here at Junkyard Life. Why, oh why didn’t they put tachometers in every truck? (Editor’s note: I sense a Ron’s Tachometer Rant coming on here. Let us hope he saves it for Fun Facts) Gentleman Jims were all long wheel based, so they rode wonderfully. With a color-keyed grill and special floor mats, now we are complete! Seen many sets of pristine Gentleman Jim floor mats? Not us. The extra nice feature truck we present to you is extra nice. This example is 100% correct down to every detail. Museum quality you ask? Why, yes. Yes, it is. It was indeed purchased from a museum with all documentation and a nice collection of literature. Bill Owens of Cleveland, Tennessee is the lucky owner. 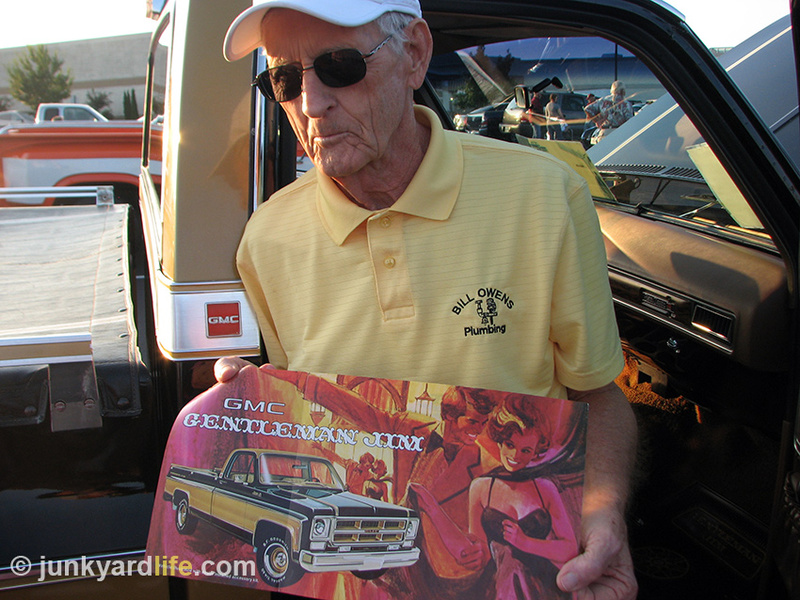 Bill has a history with Gentleman Jim trucks, which is noteworthy due to how precious few there are in existence. Fewer than 1,000 were produced according to LMC’s website. Bill Owens, owner of our featured 1975 Gentleman Jim GMC Sierra Classic, gave us a tour of his rare truck. These trucks were only built during half of the 1975 model run. Black and gold would become big color combination sales success in 1976, especially for Pontiac. The bold color duo would enjoy an even bigger success in 1977. The Gentleman Jim was based on the upscale appointed Sierra Classic. 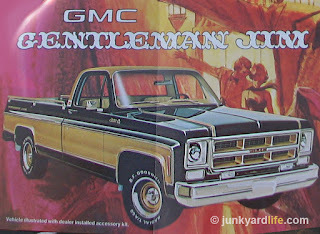 Perfect for 1975 and the bold graphic era, Gentleman Jim wore metal flake “Gentleman Jim” script on the quarter panels. Although offered with optional 454 cubic inch power, we have never seen one. If you know why, or even better, know of one, please let us know. This fact was almost presented as a question. Gentleman Jim was equipped with a tachometer! 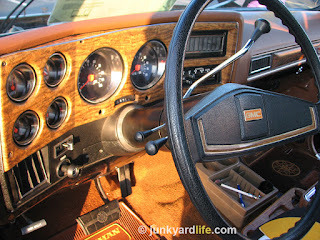 (Editor’s Note: Let the rant begin) Chevrolet and GMC both had dash boards with nice circular gauges that would have lent themselves very well for a nice useful tach. In a truck even! People pulling heavy loads could certainly use this, especially in a truck, but they forced buyers to jump through hoops of fire to get one. GMC tried to break the truck stigma of the time. Cars were used for daily transportation because there was a different mindset and trucks were not as widely accepted as they are today. In 1975, my Grandmother would not have ridden in a truck, much less have been picked up for a date in one. 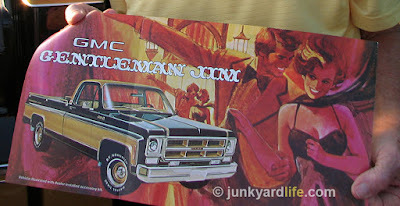 GMC advertising tried to break new ground and advocated that it was acceptable to ride in a Gentleman Jim. Wear items for Gentleman Jim Editions are highly prized and priced today. 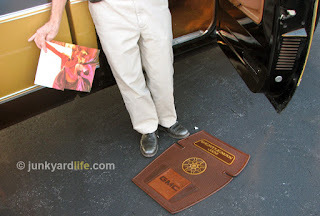 A set of Gentleman Jim floor mats went for $500 recently on Ebay. 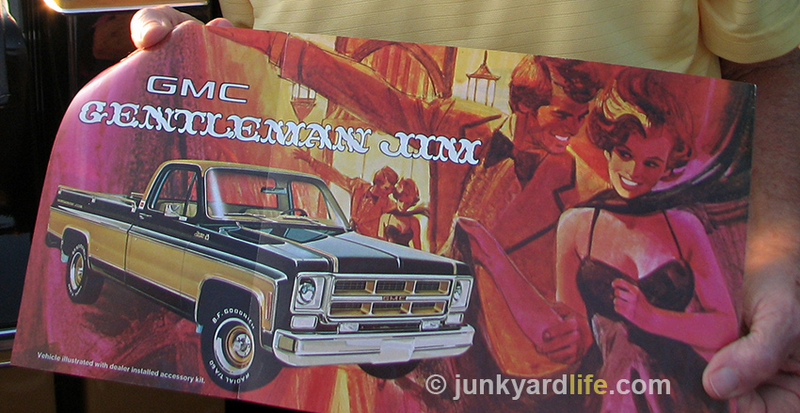 This 1975 Gentleman Jim advertisement provides not so subtle clues that the ladies will love a man who drives a Gentleman Jim GMC.